At Hornsbury Mill, we will devise customised wedding packages, from the ceremony down to the reception, for the wedding in Somerset you have always imagined. We have great contacts such as professional photographers, entertainers and decorators to make your wedding an unforgettable experience for yourselves and your guests. Immersed in the natural and stunning woodlands of Somerset, Hornsbury Mill is a picturesque country escape. Create romantic memories of quaint garden paths, gorgeous lakeside scenery and views of the spectacular fountain displays of our exquisite four-acre gardens. Have you fallen for the beautiful gardens at Hornsbury Mill? We now perform a complete wedding package for all your wedding dreams and are happy to possess a Civil Wedding License so you can now get married here on our gorgeous grounds. The Cornloft is cherished for its charming character. Decorated with high wooden beams and a white vaulted ceiling, the Cornloft is the ideal place for an intimate Somerset wedding ceremony. In the soft glow of a candlelit service, we have created the ultimate romantic setting for your wedding day. 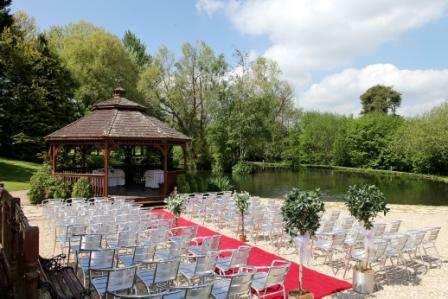 Get married in the exquisite landscaped gardens of Hornsbury Mill in our wonderful outside Gazebo. Take in the beautiful scenery of our four-acre woodland environment as you say your vows by the glittering lake. This beautifully carved wooden design is a boutique option for your wedding day. Begin your wedding celebrations in style in our fabulous Lakeside Suite. This spacious suite has panoramic views of the spectacular gardens and lake. The Lakeside Suite will hold a capacity of 200 people, private bar and disco floor for all your friends and family to enjoy and party all night long. Book and organise your Somerset Wedding with Hornsbury Mill. Contact Hornsbury Mill today on 0146063317 or send an email to info@hornsburymill.co.uk for your dream wedding.